The scoop is: you answer ten questions created by the person who tagged you. Then, you create ten questions and tag ten more book bloggers. What a great way to get to know each other better and (for me) to ask the questions I have always been curious about. I'm notoriously opinionated :) Steph's Stacks isn't my first foray into blogging, but it is by far my favorite! I have written articles for Yahoo and AOL in the past, but it became more like a job than anything (I already have one of those, so...). I stumbled across some great book blogs last year that inspired me. I've always been an avid reader and decided to fuse my passion for reading with my love for writing and here we are today. I started Steph's Stacks August of last year and I am loving it!! 3. Who are some of your favorite book bloggers? Why? Well, Five Alarm Book Reviews (natch! ), The Story Siren, Book Stacks on Deck, Sarah Says Read, Once Upon a Prologue and Mrs. Q: Book Addict are a few of my favorites from the beginning. I have found many more in the past few months, but these are the ones I have been following for the longest and am addicted to. I think our tastes are very similar and most of these ladies have been doing this for far longer than I have. I definitely look to them for guidance and and love their professionalism. 4. What series have you not even started that you would still like to dive into? 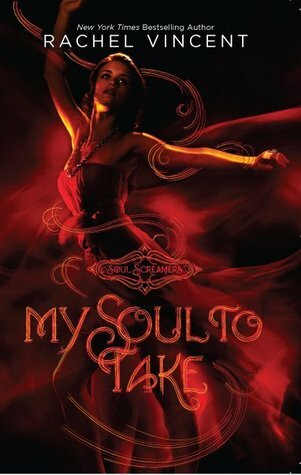 I've been wanting to dive into Rachel Vincent's Soul Screamers series. I had a copy from the library, but had zero time to get into it. So, it's still on my TBR list. 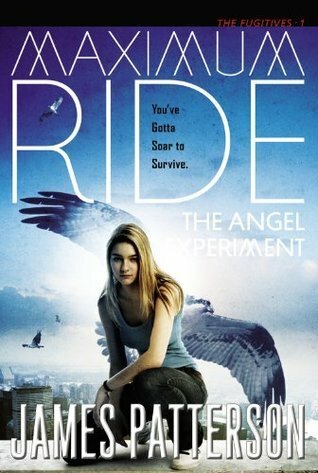 I've heard great things about James Patterson's Maximum Ride series. I just got the first book in the series, The Angel Experiment, from the library and I hope to start it this week. 5. What are your other passions besides books? 6. How many books on average do you read a year? Do you review them all? Is it hard to keep up? I gave myself the goal on Goodreads to read 150 this year and so far, I'm ahead of the game. So, maybe 200 is more like it. I've always read every night before I go to sleep and now with my TBR pile piling up, I've started getting up earlier to read before work as well. I've noticed that I'm not watching as much TV as I used to. I have an Excel file to keep me organized about my reading and reviews. I always review the ARC's I'm lucky enough to receive. The books I purchase or borrow from the library are the ones that keep getting pushed down the review list. It was hard for me at first to not ask for every book that looks great on Netgalley. If you've read my IMM's, you know that I have been known to overdo it sometimes at the library or Half Price Books. Anytime I get anxious or fell pressured to just plow through them, I have to remind myself that blogging and (more importantly) reading is supposed to be fun! I never want to put myself in a position where it feels like drudgery. 7. What are you reading right now? What do you think of it so far? So, I may be alone with this opinion, but so far, I'm not really loving it. I think Patch is an abusive jerk and Nora is a bad friend and a hot mess so far. I'm hoping that the second half will change my mind about this book, but I'm not counting on it. 8. What is your favorite series? Why? Wow. This is a hard one, because naturally I have a soft spot for the popular series like Harry Potter and Hunger Games (I could and have re-read either of these series at any time.) Some of my other favorite series are Outlander, The Girl with the Dragon Tattoo, Sookie Stackhouse and the Parasol Protectorate. I have high hopes for a few series that aren't finished yet. Such as: Glow, Cinder, Wither and the Unearthly series. My favorite book of last year was The Daughter of Smoke and Bone. If Laini Taylor keeps being so awesome (and I'm sure she will) this might turn out to be my favorite series of all time. 9. What one book are you always eager to talk about? With The Hunger Games movie coming out, I have found myself discussing this series quite a bit lately. I also have been trying to get everyone who will listen to me to read The Daughter of Smoke and Bone because it's flippin' amazing! 10. Where is your favorite reading spot? 1. What was the last book you've read that you couldn't put down? 2. How do you find time to post, network and keep up with your reading? 3. What memes do you participate in? 4. Do you have any favorite book blogging networks you use to meet other bloggers or stay up to date on the latest trends? 5. What book (being released this year) are you anticipating the most? 6. What is your favorite book to movie adaptation? Least fave? 7. How did you come up with your blog's design? Any websites, designers or tips for newbies? 8. Speaking of newbies...what is the one tip you would give to a new book blogger? 9. What social networking site do you find is bringing you the most interaction with your readership? 2. Answer the questions the tagger set for you in their post and then create ten new questions to ask the people who you have tagged. Aww you tagged me :D Im honoured. I'm going to finish it if only to see if these guys will redeem themselves :) I'm so glad you're back I missed you! Can't wait to read your answers for the Book Tag! Oh I know, audio books take so long compared to written ones! I am super excited for the Hunger Games movie too. Thanks for the tag, here are my answers! I finally finished it today. I'm still on the fence... Thanks for playing Book Tag with me. I just read your posts and loved your answers. Time Turner indeed...sign me up for one! Whenever you get time BBB4L! This post took me awhile (relatively) to do properly. So, take your time. I love your answers. I still have to read the Soul Screamers books too. Yay, I love The Walking Dead. I didn't realize the you are on the road so much. Work related or pleasure?